An Essay on the Principle of Population; or, A View of its Past and Present Effects on Human Happiness; with an Inquiry into our Prospects Respecting the Future Removal or Mitigation of the Evils which it Occasions. London: Printed for T. Johnson, 1806. 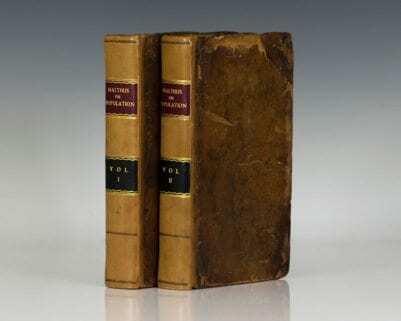 Third edition of this cornerstone text of modern economics, the first to be published in 2 volumes and the first published after the great quarto edition of 1803. 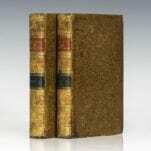 Octavo, 2 volumes, bound in contemporary calf, red and black morocco spine labels, gilt titles. In near fine condition with light rubbing. A very clean example. “Malthus was one of the founders of modern economics. His Essay was originally the product of a discussion on the perfectibility of society with his father, [who] urged him to publish. 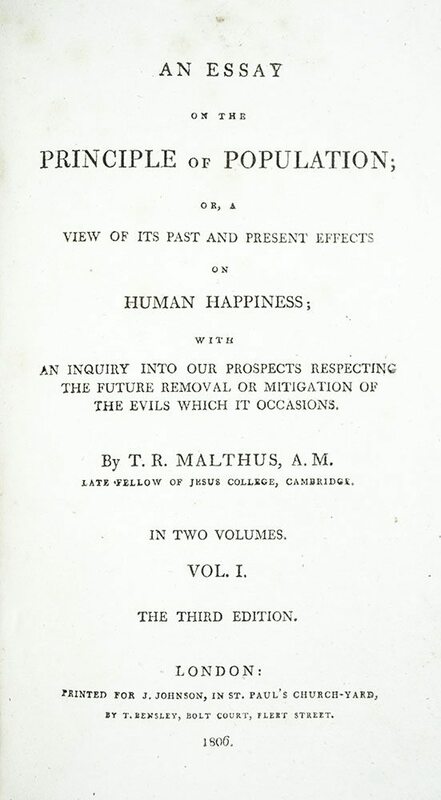 Thus the first edition (published anonymously) was essentially a fighting tract, but later editions were considerably altered and grew bulkier as Malthus defended his views against a host of critics… The Essay was highly influential in the progress of thought in early 19th-century Europe [and] his influence on social policy was considerable… Both Darwin and Wallace clearly acknowledged Malthus as a source of the idea of ‘the struggle for existence” (PMM 251). Washington: Printed and Published by Roger Chew Weightman, 1809. First American edition of this cornerstone text of modern economics. 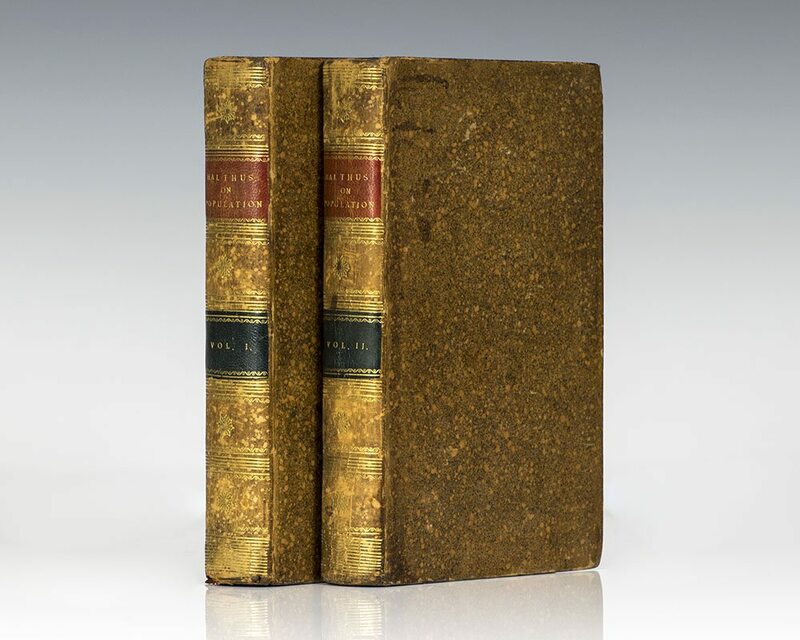 Octavo, 2 volumes, bound in contemporary calf, rebacked, red and black morocco spine labels, gilt titles. Previous owner’s inscription to front free endpaper, “An application was made to Bishop Watson to answer this book on the grounds that it discouraged benevolence. He declined, excusing himself, however unfavorably saying that he saw its object was to prove that population could not increase beyond the level of rules of self-evident truth. A much better employment would have been to discover means of resistance that might supply the increasing wants of the population.” Bishop Richard Watson served as the Bishop of Llandaff from 1782 to 1816 and published a number of political pamphlets contributing to the Revolution Controversy regarding the fundamental politics of the French Revolution. Watson corresponded with and published several counterarguments to the works of Thomas Paine and Thomas Robert Malthus among others. In very good condition with some browning to the text as usual, sporadic foxing. Rare and desirable. Boston: Wells and Lilly, 1821. First American edition of a landmark work in political economy. Octavo, bound in three quarters leather over marbled boards, black leather morocco spine label. In near fine condition. 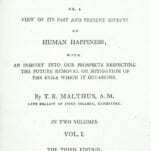 An Essay on the Principle of Population; or, A View of its Past and Present Effects on Human Happiness; with an Inquiry into our Prospects Respecting the Future Removal or Mitigation of the Evils which it Occassions. London: J. Johnson by J. Bensley, 1803. Second edition of this cornerstone text of modern economics. Quarto, bound in period-style three-quarter speckled calf, red morocco spine label, marbled boards, gilt titles and tooling to the spine, marbled endpapers. In fine condition. An exceptional example.